Upon further consideration, I have decided to add a player to my ballot. I originally submitted only four players because I feel that it is a very high honor (Magic’s highest) to be inducted into the Hall of Fame, and if I could not decide on a person to fill that fifth slot, then perhaps that slot on my ballot wasn’t meant to be filled. This is the first year in the three years I’ve been on the Selection Committee where I even considered not using all of my votes. However, after submitting my ballot, I didn’t feel comfortable leaving that slot empty. Doing so implied that I felt there was not a single eligible player remaining on the list who was deserving of being in the Hall of Fame, and that is not exactly the case. 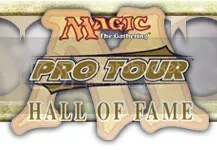 With that in mind, I have decided to add Justin Gary to my ballot for the 2013 MTG Pro Tour Hall of Fame.